The terminology used in linguistics can be confusing for those encountering the subject for the first time. 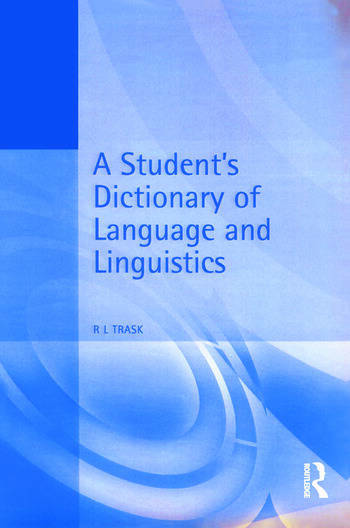 This dictionary provides accessible and authoritative explanations of the terms and concepts currently in use in all the major areas of language and linguistics, (pronunciation, word structure, sentence structure, meaning) as well as in the study of the social, anthropological, psychological and neurological aspects of language. Entries are clear and unambiguous, and helpful examples are used to clarify where appropriate. Particular attention is given to the terminology of traditional grammar. There are entries for the names of major language families, and there are also brief biographical entries for the major figures in the field, past and present. An extensive cross-referencing system makes the book easy to use: an invaluable annotated bibliography of texts on linguistics makes it an ideal guide for everyone beginning the study of language and linguistics.